In this handy pouch you will find everything you need for a single nappy change, yes I said everything. Each pouch contains 1 disposable changing mat, 1 disposable nappy, 1antiseptic hand wipe for mum and 3 large baby wipes. 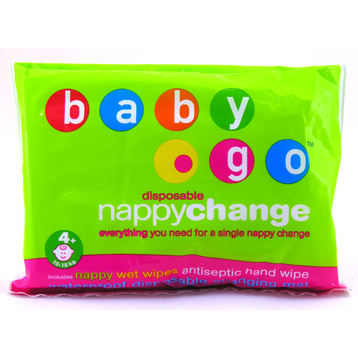 When you have completed the nappy change, wrap all soiled items in the changing mat, put them into the original plastic pouch and throw away. Never be caught out again, pop a baby go into your bag, the car or buggy and off you go. It would be useful to give a baby go to grandma when she calls to take baby out for a walk. Everything you need for a single nappy change. Includes nappy, wet wipes, antiseptic hand wipe, waterproof disposable changing mat.